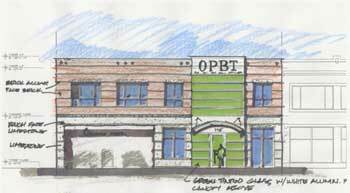 It is exciting to see a new bank building design for a long vacant site at 715 South Blvd., in Oak Park. Building is symbolic of the public confidence in the future, being such a long-term commitment. Someone sees prospect in a location, value in the purchase of the dirt and available financing. Those with the capital on hand can take advantage of the opportunity and expand their business in a very favorable market. But this is not about spread sheets and the development of property, this is about doing the right thing. All architects know that it takes a good client to make architecture, no exception here. Drive-thru banks are generally not considered as great opportunities for architecture. They tend to be wholly related and driven by our addictive device of consumption, our second home, our nemesis of sustainability, our shinny, GPS guided cars. Typically this building type is designed as a one-story free standing building like the drive thru bank across the street from the library on Lake Street. This formula would have destroyed the continuity of this historic commercial block on South Boulevard. Now, let’s consider this proposed project by Mark Zini Architects from an urban context point of view. Three qualities make this project responsible and worthy of praise. One, the proposed building fills the site, completing the urban wall with two story traditional buildings on either side. This vacant site has been an eyesore for years — like a broken tooth in an otherwise attractive block. To the bank’s credit, with the current high office vacancy rate in the village, I am surprised and delighted that they planned a second floor. The additional expense of an elevator and two stairs is substantial for this small footprint. It is great to see the building mass conceal the 11 parking spaces off the alley. Kudos to the architect and bank for proposing such a good neighbor. Secondly, the design of this building is respectful yet distinctive of the block and neighborhood. All of the buildings on the block are built of brick in various earth tones — red, burnt ochre, buff and brown, creating a lively and playful rhythm. The modern scheme repeats the traditional materials in a horizontal banded pattern of brick and rock-face limestone. To embellish the entrance a green glass was introduced recalling the Green Line stop and the monetary purpose of the building. Finally, what I appreciate about this infill design is that it does not pretend to be more than what it is. It fits comfortably in its site, completing the block the way it was intended. I do long for some elements of sustainability, such as permeable paving, bike parking/lane, geothermal heat system, solar collectors and/or a green roof. Integration of some of these elements would elevate the design to be eco responsible and educational. This is a great opportunity to showcase this business, making it stand out from the typical facilities we see in the village. But should this design be considered architecture? Even though the planning does the right thing, the architectural experience could be more compelling. The potential view from the el tracks is overlooked. The façade is a bit predictable. Perhaps the curved canopy and signage could be better integrated into the glass wall. Fortunately, this is an early sketch and the architect is well aware of the potential to refine this design, selecting the materials and coordination of the details. I anticipate that this project, combined with the village proposed new plaza, will result in a hansom street we can all be proud of.